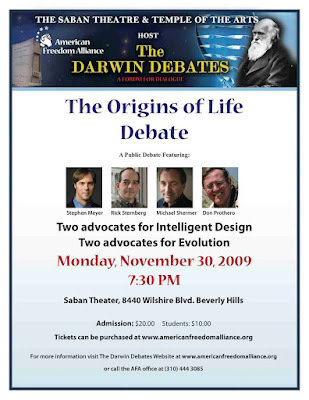 Tomorrow, Monday November 30th - 2009, the "Origins of Life Debate" will take place at the Saban Theatre, in West Los Angeles, at 7:30. Sternberg and Meyer will be debating Shermer and Prothero, the former are proponents of creationism disguised as intelligent design, the latter will be defending science. I have been asked by the one of the organizers to cover the debate. Tickets are cheap, $10 for students and $20 general admission, so if you're close by, I strongly urge you to come! It's going to be a fun night.